Welcome back, TwoMules! And thank you, Elizabeth77 and SK for getting him back here! Hey folks, I just wanted to tell Clint Eastwood how much I admired him and his work. I`m 63 and when I was in High School, there were 3 drive-ins around my home. We especially liked it when they showed the three Sergio Leone movies on the weekend specials. How many time I saw them? Uncountable. I know it is nearly impossible to personally contact him, but this forum will have to do. Even at 63 yrs old, Clint is still one of my mentors in life situations. His body of work and his personal life helped shape my life in a very positive manner. So, "Do ya feel Lucky"? Yeah, I do. Welcome to the board, 66harley. Seeing the Leone films at the drive-in sounds fun! Welcome, 66harley! Enjoy the Board! Welcome 66harley, I'm sure you'll enjoy it here.. It really feels like it was only recently I was welcomed aboard... Time sure does fly.. I just discovered this site after reading the cover story of the July 17 edition of...closer magazine, good article, so I thought I'd check to see if there was a Clint web site (and I thought I was his biggest fan). I'm probably not the first person to think of this but there should be a movement to.....CLONE CLINT. Where better to start it than here. There are some people so special that at the very least their DNA ought to be preserved in a special DNA Bank (just in case they ever perfect cloning). I want mine preserved so I can watch his new movies , maybe they will perfect C.G. enough so that cloning won't be needed. Better late than never, topgunslinger. Welcome! It's been a little quiet around here lately, but we're always happy to have a new member. Happy posting! Mule was cool. Clinto McGinto's still got it ! Every Which Way, But Loose was me first encounter of Eastwood's craft. Welcome to the Board, nico! My name is Deborah, I'm from Germany and have watched Clint Eastwood movies all my life so I figured it's about time to become a member of this forum. Welcome! We're happy to have you here! Welcome Deborah. I think it's really cool that we have Clint Eastwood fans as members of this board from all over the world. Hello everyone. I worked in the film industry for 25 years building sets. I've worked on a few Eastwood films including "Space Cowboys", "Midnight In The Garden Of Good And Evil" and a few others. No westerns though. I live in Carmel Ca. now and see Mr. Eastwood from time to time. Two years ago, he was the Grand Marshall for the Carmel Centennial Parade. 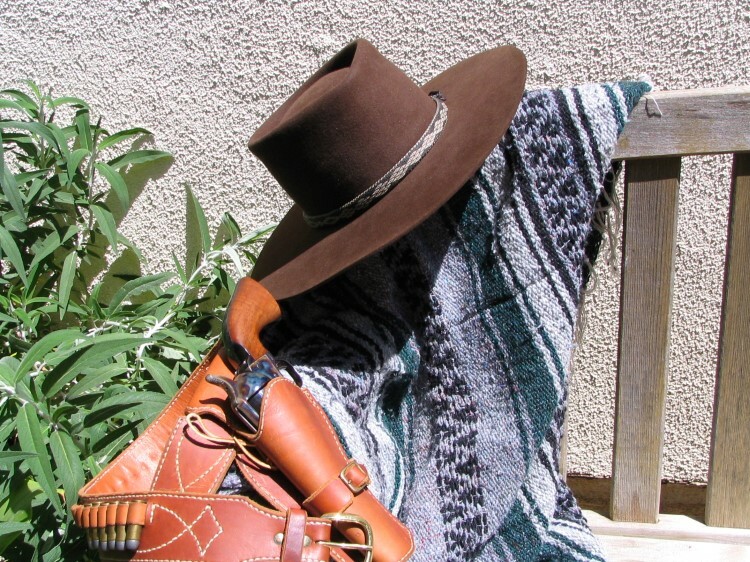 He was on a Wells Fargo stage wearing his Poncho from the Dollar trilogy, his Andy Anderson walk and draw holster, hat from "Unforgiven" and his shirt from "High Plains Drifter." He looked great for his age. Here's a sketch I did about 40 years ago. I also like to do leather work and make hats. Here's my take on Joe Kidd's hat with a copy of an Andy Anderson walk and draw rig I made.